Now in paperback! A Lilliputian world. A tree under threat. A boy hunted by his own people must protect his father's secrets in a gripping and witty eco-adventure. 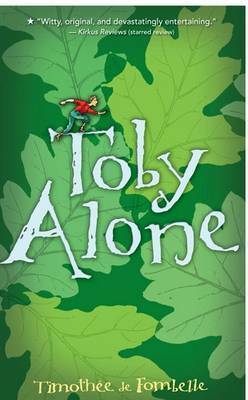 Toby Lolness may be just one and a half millimeters tall, but he s the most wanted person in his world the world of the great oak Tree. Toby s father has made a groundbreaking discovery: the Tree itself is alive, flowing with vital energy, and there may be a world beyond it. Greedy developers itch to exploit this knowledge, risking permanent damage to their natural world. Toby s family has been exiled to the lower branches, and only Toby has managed to escape but for how long? And how can he bear to leave his parents to their terrible fate?" Timothee de Fombelle is a much-admired French playwright. TOBY ALONE, highly acclaimed in France, is the first of a two-part series and has won numerous awards. Francois Place has illustrated many books and is also a renowned author in his own right. With TOBY ALONE, he has once again allowed his art true expression."